Perfect for that late bolt holt hole, click here. 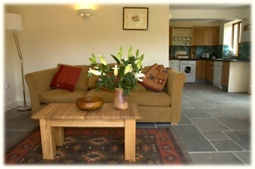 Laurel Farm Eco Cottage is designed and finished to a very high standard; it is comfortable, spacious and bright. It achieved 4 stars and a Gold Award noting the luxurious finish from Quality in Tourism; and it is Walker and Cycle friendly. It has also received the highest Gold Award from Green Tourism Business Scheme, demonstrating our commitment to sustainability and the environment. 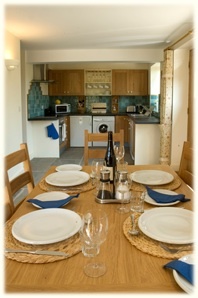 - Fully equipped kitchen, dining and living areas. - The living area has a wood burning stove and TV with DVD, CD player with radio, books, DVD’s, local information, games and toys. 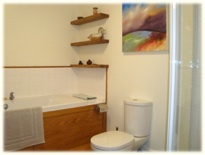 - The bathroom has a separate bath and shower. 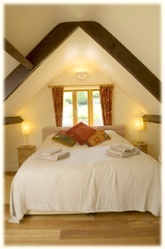 Upstairs there are two comfortable bedrooms accommodating 4 people; beds can be either twin or super king configuration. You choose what works for you. There is also a travel cot, 2 small futons, and a high chair for families and larger parties. Outside double patio doors from the living room open onto a sheltered patio with a table, 6 chairs and a parasol leading to a walled lawn and garden with a lockable shed for bikes, logs etc. 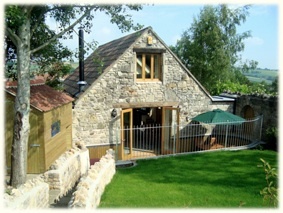 Guests are welcome to enjoy the 7 acre smallholding where we keep poultry, sheep, pigs and bees. We have Environmental Stewardship and a Community Woodland. 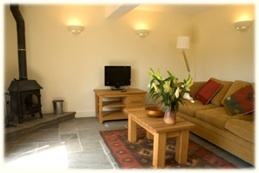 You may book the Temple space for small parties or to enjoy watching a film on the 10 foot cinema screen. We can arrange complimentary therapy treatments and creative workshops for you, please contact us for details. The Temple/Kindergarten are also available to hire for watching a film on the home cinema system. Laurel Farm Cottage has been designed with the environment in mind. Under floor heating and hot water is provided by a ground source heat pump, there are water saving devices and materials have been sustainably sourced where possible. 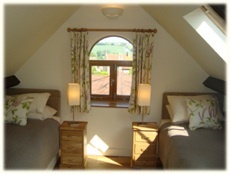 This includes beautiful European oak windows, doors, staircase, kitchen and upstairs floor. Much of the detail in the finish is in oak, one of the very few sustainable hardwoods available. Note: 5% discount for people arriving by public transport!